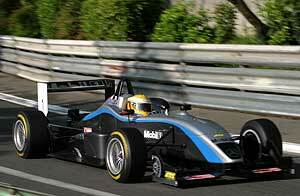 In the fourth round of the 2005 Formula 3 Euro Series season, Lewis Hamilton (ASM F3, Dallara-Mercedes) succeeded in securing his third victory, with his team-mate, Adrian Sutil (ASM F3, Dallara-Mercedes), finishing second, on the streets of Pau, France. Following his second place in yesterdays race, Loïc Duval came third, thus securing another podium finish, today. Adrian Sutil won the start and passed the pole-sitter, his team-mate Lewis Hamilton. But on lap nine his pressurising team-mate forced him into a driving mistake. Sutil spun and made slight contact with the tyre wall but could continue in second position. Behind the ASM pairing, Loïc Duval and James Rossiter (both Signature-Plus, Dallara Opel) finished third and fourth respectively, with Fabio Carbone (Signature, SLC R1-Opel), the only driver in the field to race a chassis not designed by Dallara, adding to Signatures team result by securing fifth place and scoring the first points behind the wheel of the Signature-design chassis.